The Guide to Get Rich: Asking the Right Questions and Starting to Act! 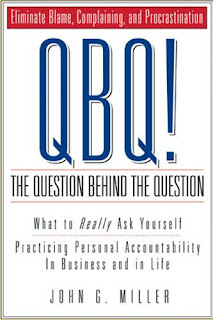 The book of the week was QBQ! by John G. Miller. 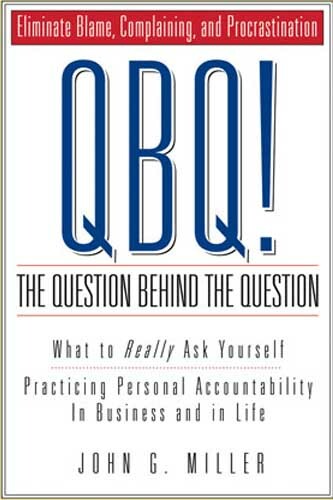 Fascinating little read... QBQ Stands for question behind the question. It focuses on what questions are really important and gets away from questions that issue blame or help you put off what should be done. Something I found quite interesting about this book was it was just over a hundred pages yet it had nearly 40 chapters. Each chapter in the book was a small story that showed what happens when the right questions are asked. There are so many great things about this story. Most people would have said "Why should I have to get a Diet Coke when we have Pepsi?" or "Why should I serve that man, he isn't sitting in my area?" or "Why are we so short staffed?" The boy didn't say any of those things, he just acted. He did what it took to make the customer happy, true customer service. Aside from the outstanding customer service from the boy, I also want to mention the manager. The manager is a true leader. He let his employees make the decision and then he acted. This is a fantastic sign of a successful organization. I really think this book is great for anyone. I think everybody could use a few lessons in personal accountability. Once someone learns to stop blaming everyone else, they really start acting and things start getting done. If you have any questions on the book don't hesitate to ask. I would be more than happy to help anyone that wants it. another stellar post, trevor! being a psychology major, I can really understand how simply rephrasing a question can make a different impact. thanks for the story of the boy and the diet coke...charming example of how servant leadership can build successful corporations! rock on, buddy!